We received a little snow over the weekend. I think I heard that it actually was the third or fourth largest amount of snow that has fallen here since the Great Halloween Snowstorm of '91. I think we got about a foot of snow at my house; the offical readings are 6" to 18" around the city and up to 3 ft in the southern part of the state. It looks so nice and pretty on the ground. When it snows like this, most cities declare a "Snow Emergency" (note capitalization) It is up to each city to decide what consititues a Snow Emergency, what rules they want to enforce and when to call it. A Snow Emergency will be declared no later than 6 p.m. on any given day. At 9 p.m. on that day, Snow Emergency parking rules begin.Park on either side of non-Snow Emergency routes (these streets DO NOT have the red sign: Snow Emergency Route).Do not park on either side of the street with the red sign: Snow Emergency Route. Snow plows will clear those streets first.After a street is fully plowed to the curb, feel free to park there, even if Snow Emergency parking rules are still in effect. Fully plowed means the street is completely cleared and plowed to the curb. Plows may come through more than once, so make sure that it is fully plowed to the curb before parking. At 8 a.m., Day Two parking rules begin. Park on the odd side of non-Snow Emergency Route streets (example: house address number 1359 Maple or 2513 17th Ave.). Park on either side of streets with the red sign: Snow Emergency Route.Do not park on the EVEN side of non-Snow Emergency routes. (Example: house address number: 1356 Maple or 2512 17th Ave.)Do not park on either side of parkways.After a street is fully plowed to the curb, feel free to park there, even if Snow Emergency parking rules are still in effect. Fully plowed means the street is completely cleared and plowed to the curb. Plows may come through more than once, so make sure that it is fully plowed to the curb before parking. At 8 a.m., Day Three parking rules begin.Park on even side of non-Snow Emergency Route streets. (Example: house address number: 1356 Maple or 2512 17th Ave.)Park on either side of streets marked with the red sign: Snow Emergency Route and you may park on parkways.Do not park on the ODD side of non-Snow Emergency Route streets (example: house address number 1359 or 2513 17th Ave.).After a street is fully plowed to the curb, feel free to park there, even if Snow Emergency parking rules are still in effect. Fully plowed means the street is completely cleared and plowed to the curb. Plows may come through more than once, so make sure that it is fully plowed to the curb before parking. Got that? I hope so. Because if you screw up, you will be ticketed ($34). You will probably also be towed ($138 + $18/day storage charge. If you have a big vehicle it will be $175 + $45 per half hour for the towing + $18/day storage). If you don't get towed, by the time the plows pass by you will wish you had been towed. Shoveling that plowed, compacted snow is heart attack inducing. I notice now that the impound lot (which by the way is located on the parcel of land that is most inconvenient to everyone in the city), now takes credit cards. The year my car was towed they only took cash, which made for a pleasant afternoon of riding the city bus to the bank and then to the impound lot. Tonight on the news (I would bet money on this) there will be a news camera & a newbie reporter down at the impound lot interviewing pissed off car owners waiting in an endless line with a wad of money to pick up their cars. Oh, and don't forget to shovel your sidewalks. You have 24 hours from the last snowflake to get it done. If someone has to come out and do it for you, there is a fine. On the bright side, Minneapolis offers free sand (your tax dollars at work). Builders of bungalows back in the day must have had a quirky sense of humor. And every now and then they slid one of their little jokes into a house design. Last summer at the block club picnic, one of my neighbors asked me if my house was the one with "the hallway with all the doors." Yes indeed, that is my house. I have a small little 6'x10' hallway that has, count em, 8 doors opening directly into it. With the exception of the living room, every room in my house opens into this little hallway. They actually could have fit in one more door, if they had planned just a little better. It humors me. It also is pretty darn convenient when you want to separate the "public" rooms from the "private" rooms. 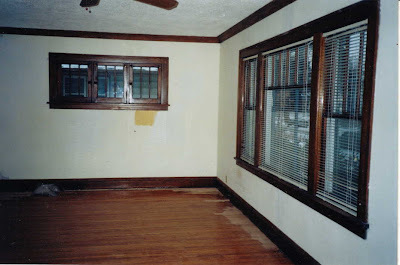 When I refinished my oak dining room and living room floors, I could block off those rooms and still had total access to the important rooms of the house (bedroom, bathroom, kitchen). Somewhere along the line, 2 of the doors have been removed and stored in the basement. One day just to amuse myself, I'm going to reinstall the missing doors and then open and shut all of the doors. Here is the light switch at the bottom of my basement steps. It took my electrician about 30 minutes to install and cost me about $40. For some 80 years before that light switch was installed, StuccoHouse owners crept their way down the steep basement steps, paused on the bottom step, put their arms out straight in front of them, and then took their first step into total darkness slowly moving their outstreached arms from side to side - heart beating a little faster.......until their fingers touched the hanging string of the sole ceiling light fixture located on the other side of the basement. The imaginary visual makes me chuckle. A "for sale" sign went up at a house down the block from me. It is one of the smallest houses on the block, but still has the charm of a 1920's bungalow. In the privacy of my blog, I will tell you I was happy to see the sign go up. I have my suspicions about the current owners of this house. None of my suspicions have been confirmed, so it is pure speculation. How many "friends" can one family have that stop in at all hours of the day & night, leave their car running in the street, and run up to your house to say "hi"? It's never a good sign when you are walking down your street and spot an unmarked car that appears to be keeping your neighbor's house under surveilance. It also leads one to jump to conclusions when that same house, after realizing that their house is under observation, instructs their "friends" to "visit" via the back alleyway. So, I'm anxious to see who buys the place. I suspect it is a fixer-upper. But it is a good block, so if someone gets it at a reasonable price it should be a good investment. Oh, I was so very bad today. I had an appointment this morning to have my company taxes done. Ugh. After I finished this ugly task, I was feeling a little sorry for myself having had to pour over receipts for the past few days & then sit with my crazy accountant for an hour. So, I decided to stop at LightWorks, a cool local vintage lighting stores, on my way home. Well, "on my way home" if that means a 20 mile side trip. Semantics. Anywho, I was browsing through their showroom when I ran across a pair of hand painted sconces (top of photo). Hand painted sconces that match the sconce I picked up on salvage last week (bottom of photo)....and also match the pink hanging lamp I picked up at that same sale. Hand painted sconces that would fit perfectly in my sunroom (with the hanging lamp in the adjoining room and the single sconce in the walk-in closet). I got a little giddy. This was A Sign, right? They were expensive. So, I rationalized that if I averaged out what I spent on all 4 lights, I was still doing ok. It's really the "price per room" that counts, right? I also picked up some cool, vintage style, pink light bulbs (they have a little swirl on top). They are Permalite bulbs made by ADL, Inc. out of California. I called the company in the hopes of getting their catalog with their other vintage style bulbs, but they are wholesale and could not have been less interested in helping me find a dealer to talk to about their complete line (yes, I've seen the dealer list on their website). So, I'll save that battle for another day. This is the final installment in my "whatever made those dark stains on your hardwood floors?" trilogy. After pulling out and replacing each and every pee stained board, I called the floor guy in to sand the floors & then refinish them. I had him use an oil based poly finish. Two layers of gloss for the durability and a top layer of semi gloss for the nice sheen. Oil is more of a pain in the neck to apply and takes a lot longer to cure, but it also develops a nice golden glow as it ages. Some people love to poo-poo polyurathane as if poly was one product. This makes me crazy because what they fail to understand is that an oil based poly *is* a varnish - it just has a man made resin in it instead of natural resin with similar properties. It's the kissing cousin to the traditional varnish that has been put on wood floors for 100 or so years. Okay, sorry I got a bit off tangent there. It's a pet peeve. Anyway, the floor turned out well. It's been three years since the work was completed and as the top finish goldens, the replaced boards become harder & harder to pick out. If you didn't know the story, you would never notice the work done. The whole thing is just kind of a vague homeowner memory form me now. But as you can imagine, I now have a rather frosty relationship with cats in general. **No, it can't be sanded out. It would look like it was sanded off and everyone would get all excited and hopeful but the minute you went to put the finish on, the stain would reappear. In fact, when I took a closer look at my floors I realized that one of the PO's had sanded down the stains and refinished over them. 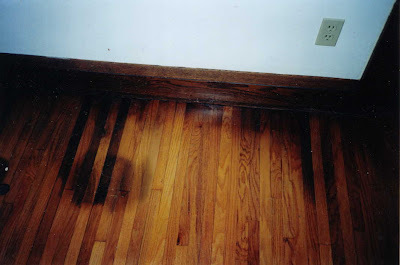 **The pee chemically changes the composition of the wood and if the stain is black, it has gone deep beyond the surface. If the stain is whitish, it is probably stopped by the finish and may just need a new finish. **There are urban legends that pee stains can be bleached out. Everyone insists that their cousin's best friend's brother's roommate has done this and it worked. In the floor guy's many years of working with floors, he had never seen this work. But, he would give me the name of some chemicals to try, if I wanted to try this route. **If I could not live with the pee stains, I had two options. 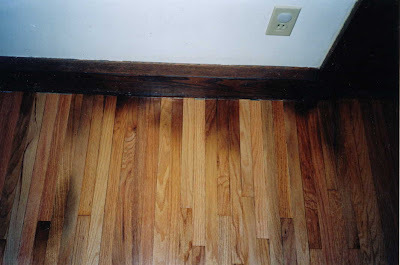 1) Stain the floors darker and finish. 2) Replace the boards, sand and finish. So, I mulled this information over for a few days. I decided to give the wood bleach a try (what the heck). He was right. The stain laughed at the bleach and did not budge. I spent a few more days thinking about it all. I knew that there was no way I could live with the pee floors. I also decided that I didn't want to stain the floors a darker color. I would know there was pee under there....and it would eat away at me. In the process of standing there staring at the floors, I realized that something was wrong with the base shoe (quarter round). It had this odd shine to it. When I got down there to take a closer look, I was stunned to discover that the PO had used a oak looking, paper covered, foam quarter round. I had no idea they even sold crap like that. I pulled it all off. Amazingly, this foam seemed to be the source of the pee smell - it had absorbed it like a sponge. Once it was out of the house, so was the smell. In the end, I decided to replace the pee boards. I wish I had taken more photos of this process. The process was time consuming, but pretty easy. We removed the first board by making a hole in the center and then using a jigsaw to cut out the stained portion of the board. We then staggared the cuts and removed one board after another. At first I was all optomistic that I could remove, say, every 4th board and leave the rest. Well after seeing the new boards in place, I knew that I needed to pull all of the stained boards. I wanted to do this once, and be done with it. So, back to work we went and pulled the remaining boards. In the photo, you can see the length of the living room with the section of boards replaced. We used new red oak "shorties" and they worked fine with the old wood. My rooms have fairly short strips of wood, so the shorties worked. If the room had had longer strips of wood, it would have been important to use longer replacement strips so they would blend in. We surfaced nailed individual replaced boards & countersunk the nails. If there was a few boards in a row, we put a nail in the tongue instead of the surface but it was pretty difficult to work in such tight quarters. As the last step on the replacement phase, we put down wood filler (nice to fill the pores in oak). Next post: The sanding guy arrives...and it's as if a cat never set foot in the place. I'm going to break this next project story down into three separate posts. This project was completed B.B. (before I started my blog) and to be honest I'm still a little scarred by it. In fact, it was the second project I completed on my house and it was also the dawning that StuccoHouse was going to be a little more work than I had fully anticipated. 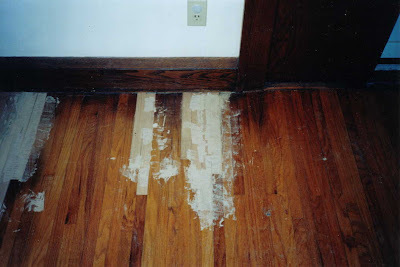 When I first toured StuccoHouse with my realtor, I noticed that some of the floors were a bit discolored. I knew that I was going to have the floors refinished, so this wasn't a huge concern of mine. When I was moving into the house, I noticed that the dark floor stains were much more extensive than what I saw on my pre-purchase tour. The clever PO had strategically place furniture, I think. With the rooms bare, I could see the oak flooring was stained a foot (or more) out from the baseboard around most of the perimeter of both the dining room & the living room. The entrance and all of the corners were particularly bad. I figured that at some point one of the PO's had left some of the many windows in these two rooms open and it had rained in on the floors. Keep in mind that I moved into the house at the end of October. The fact that it was cold, kept me blessedly protected from one of the main clues as to what caused this staining. Oh, the innocence. So, I started naively calling around to have a floor guy come in and sand & refinish the floors. I had three guys out for bids. Much to my horror, one after another they informed me that the stains I was seeing were caused by cat pee (a tiny piece of trivia - dogs pee in the middle of floors & cats along the wall). Cat pee. I had just purchased a pee house. Then, as if on cue to confirm what I was hearing from the floor guys, we had a warm weather day and StuccoHouse house was filled with the distinct aroma of pee. Next post: Whatever is a girl faced with pee stained floors to do?! All we have been hearing here in MN for the past week is.....blah, blah, blah, temps of -20, blah, blah, blah, windchills of -40, blah, blah, blah, skin can freeze in 10 minutes, blah, blah. It's cold out. Tomorrow everyone except me will be watching football. I don't get football. Baseball, basketball, hockey, soccer, yes. Football, no. I have had countless people try to patiently explain it to me over the years. Yawn. If I'm forced to watch it, I clap for the team with the best color of uniforms. But if I have my choice, I'd rather do something else. Cold weather keeping me cooped up indoors with no one to talk to. The perfect storm of boredom. I've experienced this boredom on Super Bowl Sundays past. I know what to expect. It's driven me to paint entire rooms. It's motivated me to tear down bathroom wallpaper.